If you haven't caught on, there's a huge and vibrant rock and metal scene in Ireland. In the last 60 days I've had some great stuff cross my desk from modern metal (Interrogate) to quite sophisticated progressive rock (Dead Heroes Club). Now Karuna, a melodic power metal band, enters the picture. Formed in 2002, Karuna has been taking shape for several years now. With their self-financed (and far too short) three song EP, Netherworld, the band has stabilized and hopes for the greener pastures of international recognition and that elusive record deal. Honestly, Karuna is on the right path because Netherworld is a solid dose of melodic metal. Even with only three songs, Netherworld displays Karuna's fundamental understanding and sharp execution of the genre. Every song has a strong composition with sound development highlighting well-placed solos from guitar and keyboards. On the former, Karuna brought in Stefano Droetto of Highlord to rip it up on 'The Lost.' Not forgetting the importance of solid harmony in the vocal arrangements, the band recruited Threshold and Dragonforce producer Karl Groom to work his magic to excellent results. All this shows forethought and professionalism as Karuna treads that rocky path to recognition. While all three songs are quite good, my favorite was easily the more intricate Wayfarer. My only disappointment? Even for an EP, Netherworld is far too short. Vocalist Colin Callanan indicated to me that he had a least two albums worth of songs. I wish he would have pitched us a least two more on this disc. 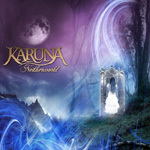 Karuna's Netherworld is a first class debut from this upstart melodic metal band from Ireland. Blending strong vocal arrangements with sound musicianship and song composition makes Netherworld a strong entry into the melodic power metal field.